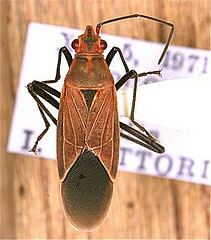 B. coimbatorensis adult. Dried museum specimen from the Japan National Institute for Agro-Environmental Sciences. Physical description: About 10 to 15 mm in length. Reddish or reddish ochre dorsal side with brownish black membrane. Pronotum similar in shape to L. augur. Ventral side red with black areas near red coxae. Appendages are brownish. Satyanarayana, K. and Sukumar, K. (1985): Sterility and retardation of oocyte growth by penfluron in soapnut bug Leptocoris coimbatorensis (Gross) (Hemiptera, Coreidae). Z. ang. Ent., 100, 367-372.